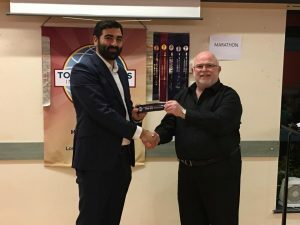 Tabletopics challenging bilinguality (if that is a word, which I doubt), led with a mixture of verve and seeming bafflement from HOD’s prodigal, Angela Lansbury, freshly returned from her Singapore travels. not-his-first-speech Ice-breaker underpinned by the unheard, but silently-present gentle tune of George Harrison’s “While My Guitar Gently Weeps” through Denise St Cyr’s wholehearted love and admiration for her seriously body-built brother in “Len’s The Man!! !” – some serious musculature there. 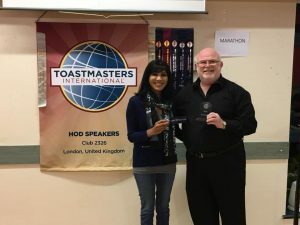 Sonia Gonzalez took us somewhere completely different, seamlessly making a speech and having a conversation with the audience, getting great responses with participation and gales of laughter…. “English Sounds” was a guide to how Spanish speakers get to learn the complexities of the English vowel system, complete with dipthongs, looooong vowels – the difference between “Sheep” and “Ship” and lots more, besides. 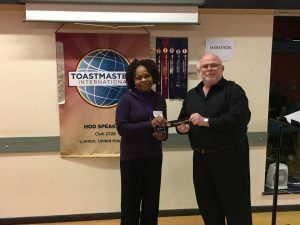 Angela Hook talked passionately and sensitively about her voluntary work facilitating holidays with underprivileged children, with everyone listening intently to her heartfelt clear story. more than a whisper pulled people forward in their seats to not miss the humour and lesson from the story. 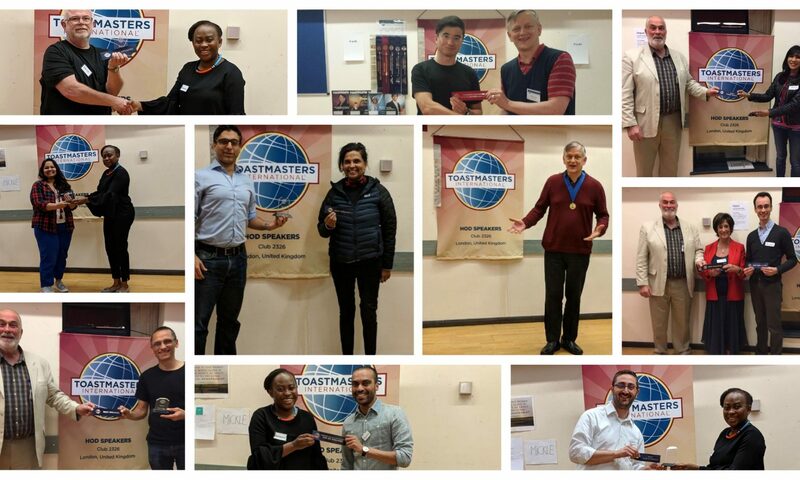 Our guest grammarian Philip Carey from across the Toastmasters District border – Hertfordshire Speakers – brought a fresh eye and perspective to our multilingual verbosity… we pleased him. Previous PostPrevious Do you fancy being on the HOD committee for 2017/18?